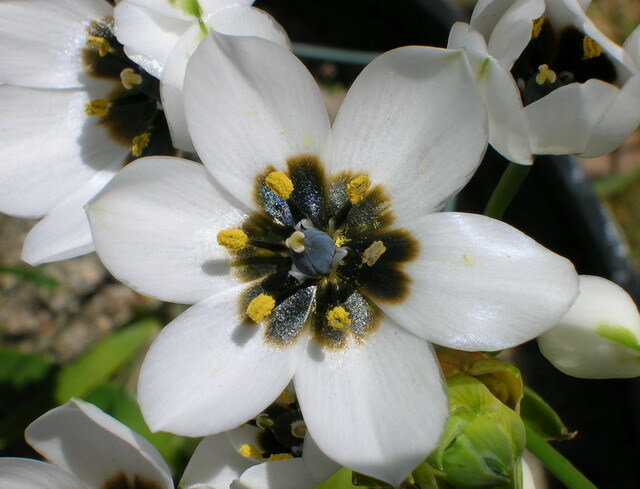 Ornithogalum is a genus of plants that belongs to the family Hyacinthaceae. This genus has many species but is practically unknown in cultivation except for the more charismatic yellow and orange species. Apart from these colorful ones, there are other striking species in Group C (see below) with small compact plants with rather large flowers which are excellent for pot cultivation. All species have flowers with a silky texture that is very attractive. A) Tender autumn-winter-spring growers from southwestern South Africa. They are mostly spring bloomers. They demand intense sunlight and rather frost free conditions. They require a dry summer dormancy. B) Tender spring-summer-autumn growers from hot subtropical to tropical Africa. They are mostly late spring/summer bloomers. Most demand intense sunlight and frost free to hot conditions. They require a dry winter dormancy. C) Hardy to very hardy autumn-winter-spring growers from the countries around the Mediterranean Sea. They are mostly spring bloomers. They demand good sunlight and cool growing conditions. The taxonomy of this genus has gone through some major changes in 5 years. Manning et al. 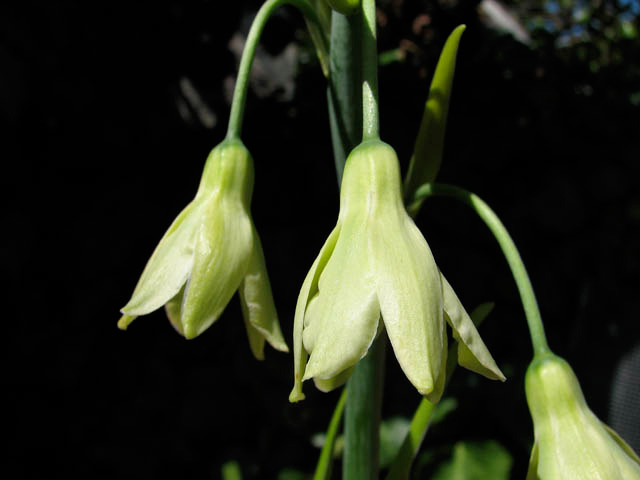 2004 propose sinking Albuca, Dipcadi, Galtonia, Neopatersonia, and Pseudogaltonia into Ornithogalum. Manning et al. 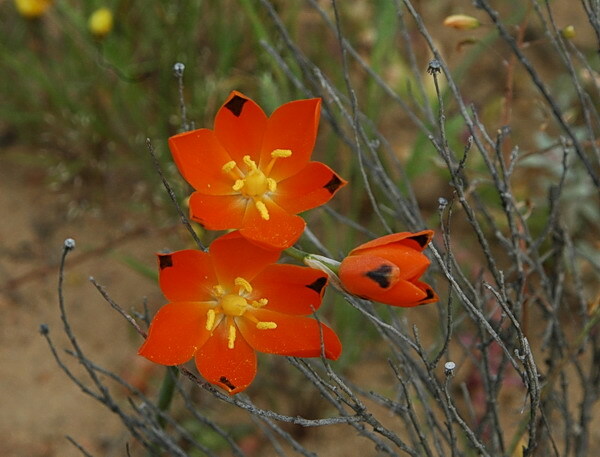 2009 using four plastid DNA regions classified the 2004 Ornithogalum into 3 clades. Clade A is recognized as the genus Albuca. Clade B comprises the genera Dipcadi and Pseudogaltonia. 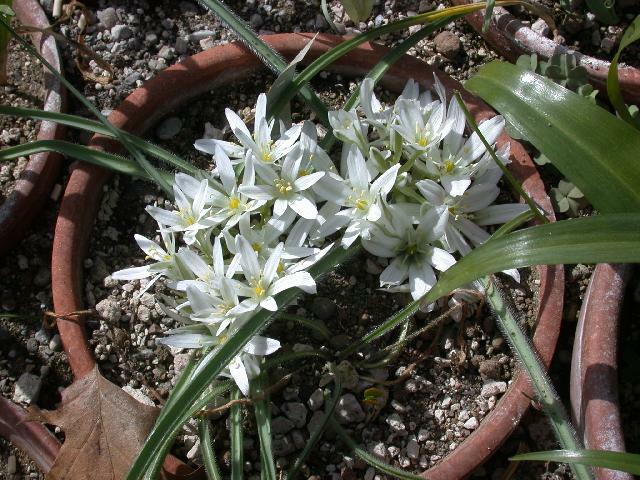 Clade C is the genus Ornithogalum and includes Galtonia and Neopatersonia. Clade A and Clade C are differentiated as follows: Clade A (Albuca) has a well-defined green or brownish median longitudinal band on the outer surface of each tepal and a concentration of 3-5 veins along the midline. 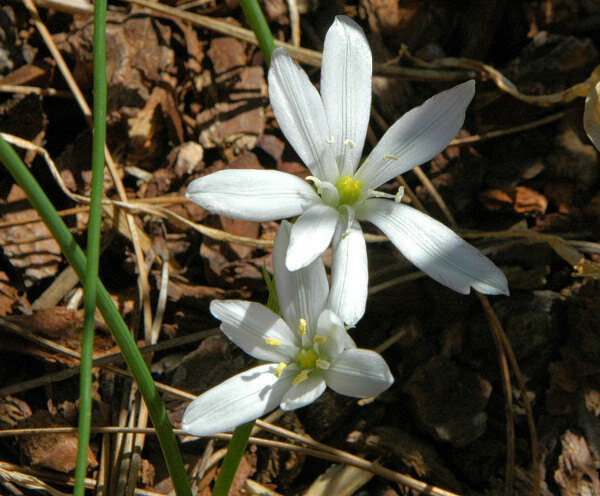 Clade C (Ornithogalum) has uniformly colored tepals with at the most a narrow or indistinct darker band without the veins. 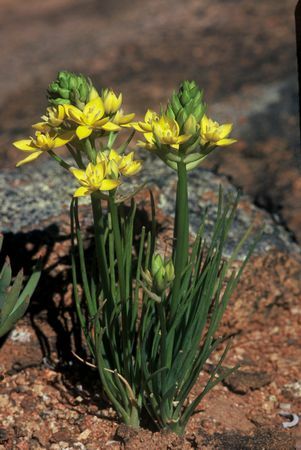 This means that species that were previously considered to belong in Ornithogalum are now included in Albuca. We will be conforming to these changes, but keeping the synonyms as plants will still be found in books and in the trade under their previous names. A common name for a number of species is 'Star of Bethlehem'. Fresh seeds of this genus are often very easy to germinate. South African species often have a short viability time of about 6 months to a year. Seeds of some species such as O. dubium are tiny and dust-like. In such cases, they should be sown in a well-drained mix of 1:1 organic:inorganic mix with the top being a fine mix so that the tiny seedlings will not be shaded out by mix particles. Otherwise, sow regular sized seeds normally in the same mix as above. Photos of a few of the species are shown below.